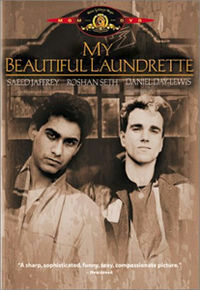 My Beautiful Laundrette is a 1985 film directed by Stephen Frears. The screenplay was written by Hanif Kureishi. Omar (Gordon Warnecke) is the son of a Pakistani journalist who lives in London but hates Britain and its international politics. By contrast, Omar's paternal uncle Nasser is a successful entrepreneur and an active member of the London Asian community. Omar's father asks his uncle to give him a job and, after working for a brief time as a car washer in one of his uncle's garages, he is assigned the task of running a run-down laundrette and turning it into a profitable business.